Harlech is one of four mighty castles (along with Beaumaris, Conwy and Caernarfon, all of which I have described in previous entries) built by Edward I in the late 13th century to secure his conquest of Wales. Like the others, Harlech was designed by his master architect and engineer, James of St. George, and cost the equivalent of many millions of pounds in today's money, but unlike the others it was built very quickly; in just seven years, between 1283 and 1290. 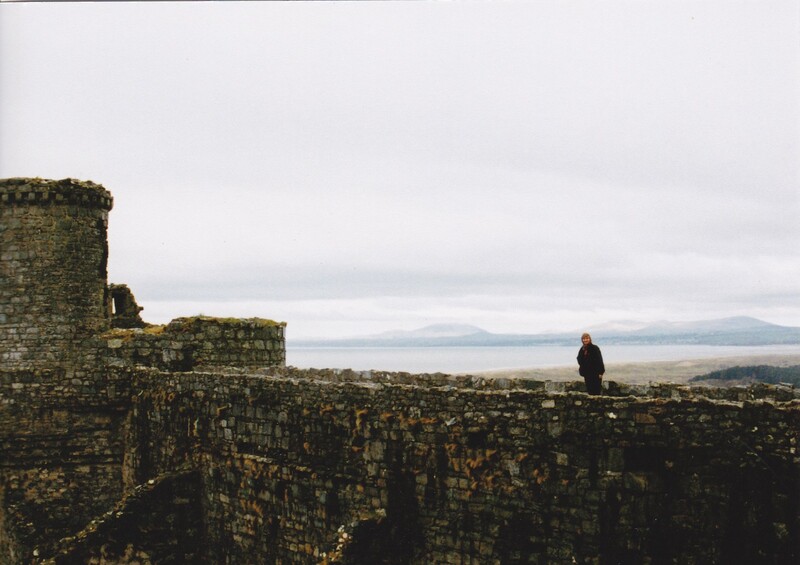 This photograph, taken from a postcard, shows the immensely strong position chosen by Master James. It stands on an outcrop of rock, with the sea to the west (the direction from which this was taken). 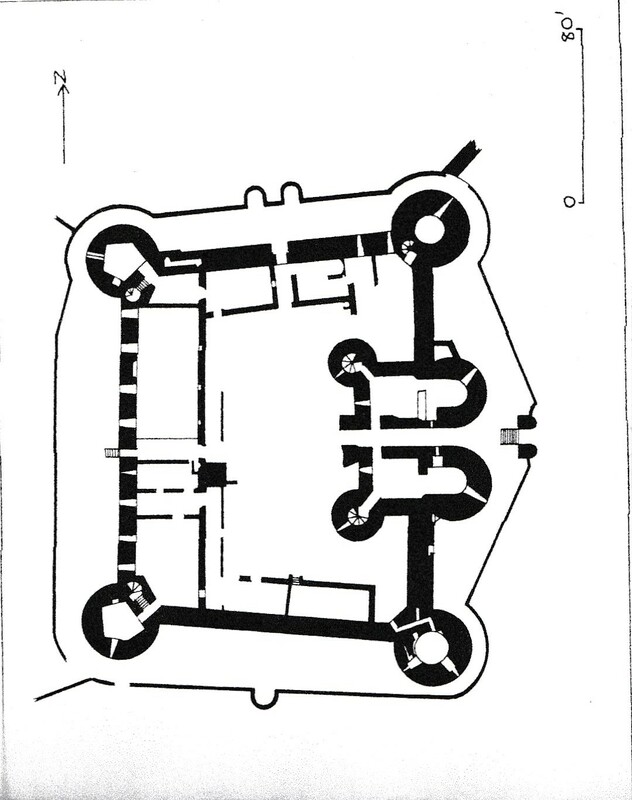 There is a moat and a low outer wall, with the only entry being from the east, where the modern town is situated. 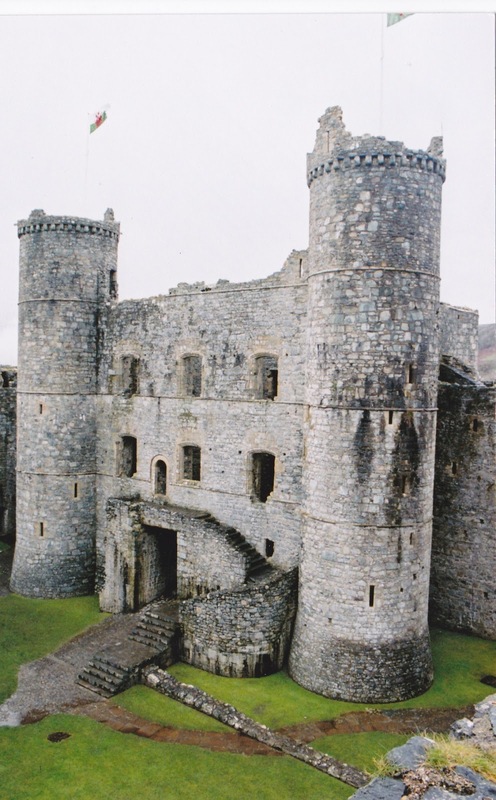 The castle is in the form of an inner courtyard, or bailey, almost square in shape, with four massive round towers at the corners. Within the bailey were placed the great hall and other buildings. 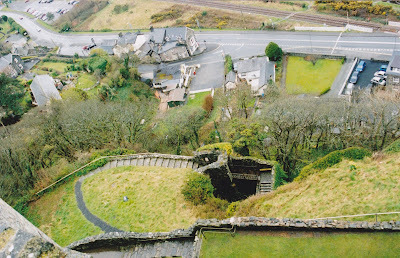 The gatehouse is entered by staircases from the bailey. This is the view down on the western side. When the castle was built, these precipitous steps led down to the sea, and there would have been boats at the bottom, so in emergencies the castle could have been supplied by water. The sea has retreated since then and is now on the far side of the railway line. The Northern wall provides a view all the way up the coast to the Lleyn peninsula, showing once again the strategic value of the site. 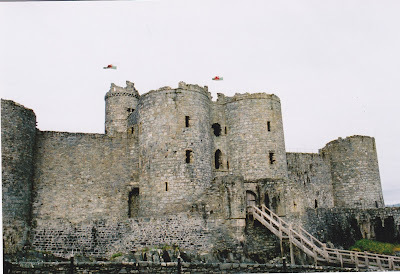 Harlech's defences were soon tested by the Welsh prince Madog ap Llewellyn in 1294, and proved their worth when a garrison of just 37 men successfully repelled the assault. But then over the next century the magnificent fortress was allowed to decay, and is described in cotemporary sources as "weak and ruinous". 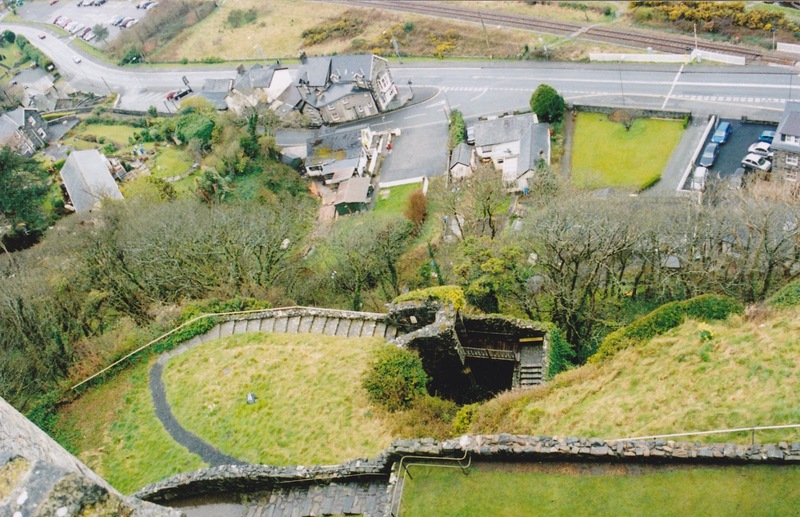 At the start of the 15th century it was besieged by Owain Glyndwr, and although he was not able to take it by storm, he eventually starved the garrison into surrender. 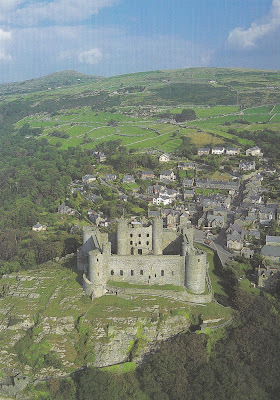 Owain then made Harlech his headquarters in his campaign to free Wales from English rule. 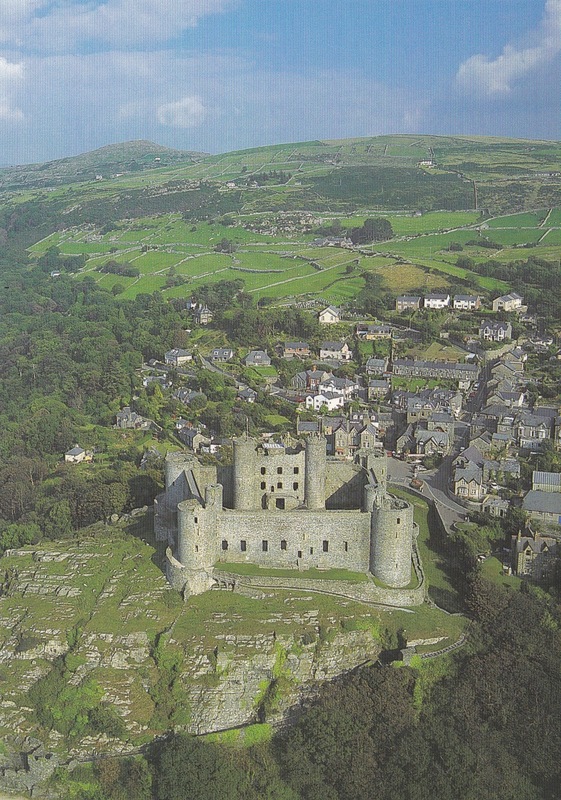 However, in 1409 King Henry IV sent a strong force which was able to retake Harlech. Owain managed to evade capture, but the days of his power were gone. The stirring partiotic song, "Men of Harlech", which serves as virtually an alternative Welsh national anthem, was first published in 1830, but was probably much older. Various English translations have appeared since then, and can be heard on youtube. What I found interesting was in the photo of the inside of the gatehouse you can see a course of stone that runs across the inside of the gatehouse structure roughly at sill height of the openings at each floor with one at the top. It doesn't happen on the outside of the gatehouse. I wonder if it is just decorative or has a structural function? A personal note: When I was very young I worked in a communication center in Baumholder Germany. The basement where we had our grounds located had supposedly been a Gestapo holding cell. Have no way of knowing if that's true, but it was depressing.